"Best craft show of the season. My family looks forward to the one in Chantilly, VA every year." "Last Saturday I went back to the Richmond Raceway... In my opinion the Craftsman Classic is SO far Superior!... I doubt I will bother with any other show again!" 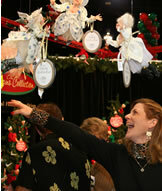 "Love the Gilmore Craft Shows...The only place you can fine unique and one of a kind gifts." "Love the e-mail reminders. I always come when I am in town." "We went to the show and it was one of the better times we've had. We've made friends with a number of the artists and look forward to seeing them at your shows." "I have been to your shows in Greensboro. Nothing compares and I cannot get to you often enough. Thanks"
"I really enjoyed your show in Myrtle Beach. There was a very good mix of vendors and had products at reasonable prices. It was much better than the 2008 Christmas show." to seeing them at your shows." and I cannot get to you often enough. Thanks ." “Please keep me on your list. I'm disappointed when I miss a show. I got sooooo many cute things there last time. Looking forward to the next show." "Thanks. Just got home from the show and it was SUPER!" "Loved your Richmond show! I was actually there for the Petty driving experience with my husband, thank you for giving me a little fun that day also... I bought alot and got alot from the You have a great show, I will let people know, I also have the calender for next year, hope to see you in Chantilly or maybe Richmond again." "We are writing to let you know how much we enjoyed the show today at the Convention Center in Myrtle Beach. We have lived here for nearly 20 years, and because we experienced much disappointment in the past shows, we stopped going for about 6 years. This years show was the most wonderful in memory. The craftsmen were extraordinary and the wares unique and masterful. By far the very best we have seen through the years." "We enjoy this event very much." "Thank you kindly!! Will look forward to attending your next show, it has become a tradition for my daughter and me. "Thanks. 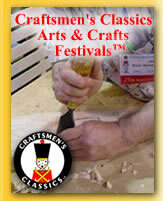 I will definitely be attending the Richmond Craftsmen's Classic. I look forward to it every year." "Thank you for the reminder about the Craftsmen’s show. 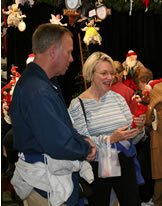 It is my favorite craft show and I buy almost all my Christmas gifts there." "I don't want to miss the craft show!!! I always look forward to shopping." "I have been to every show for the last 15 years and look forward to going every year. It is truely the best arts and crafts show around." "I love the variety and quality of items at your shows!" "All I can say is thank you! Your Christmas show was wonderful, the skill of the craftsmen on display was awesome"
"This is the only craft show I attend. I always find something new or different. Thank you for the reminder, I don’t want to miss it." "We moved last year about an hour away, but we still plan to attend your show. Thank you for the coupon." "I have attended your shows for years. I love visiting with the exhibitors and finding so many wonderful gifts. I always get something for myself too. It is a great show!" "I would like to tell you that the Richmond show was one of the best that my husband and I have attended. There were several unique artists that we have never before seen. Thank you for putting together such a great show and for helping me locate the artist." "This is impressive customer service! Thank you so much - this is exactly the person we were looking for. I can't believe it! I will definitely be at the next Gilmore show in my area." I want to thank you so very much for an EXCELLENT event. 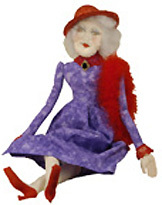 Three of my Red Hat Society friends and I attended the Festival yesterday (Saturday). We had an awesome time! Sometimes they go along with me just to see what I'll come up with -- and they were absolutely stunned. (They're not into crafts like I am.) They were amazed at the quality and diversity of the craftspeople represented. " "I have lived here for almost 20 years and have only missed 2 of your shows. I am now moving to Ft. Benning, GA and would love to see you... I enjoy your shows tremendously and spend WAY more than I should while there." "You guys are Super!!! No wonder you are the best show!!! Look forward to the spring show as well as Christmas (my favorite)! Thanks for the coupon too!!! Keep up the great work & we will see you soon!!!!!" "Thanks for sending the email reminder. We're coming up that way and won't miss it! It is big event for our family. The grandchildren really enjoy watching the crafters demonstrate how they do it. It is an education for all of us." I want to thank you so very much for an EXCELLENT event. Three of my Red Hat Society friends and I attended the Festival yesterday (Saturday). We had an awesome time! Sometimes they go along with me just to see what I'll come up with -- and they were absolutely stunned. (They're not into crafts like I am.) They were amazed at the quality and diversity of the craftspeople represented. Over lunch, after we left the Festival, all three of the ladies commented on the quality and skill and creativity and craftsmanship -- oh, I could go on and on. I won't have to twist their arms to return to a Gilmore Show next year. And you'd better believe that they'll spread the word and I'll have more than 3 others headed your way. Thanks for a wonderful day."